Abigail Perkiss from Kean University looks at the practical consequences of the Supreme Court’s Voting Rights decision earlier this year, about a month after the first elections were held since the Shelby County decision was announced. Earlier this month, on November 5, 2013, American voters went to the polls for the first time since the U.S. Supreme Court issued its decision in Shelby County v. Holder, striking down a key provision of the 1965 Voting Rights Act. Fifty years earlier, civil rights activists in Mississippi organized an unofficial statewide election, dubbed the Freedom Ballot, to coincide with the November 1963 gubernatorial race. Championing equality at the polls, the Student Nonviolent Coordinating Committee (SNCC) sought to challenge racially oppressive literacy tests and other voter qualification measures, by calling on black residents to cast their votes. At the end of the month-long campaign, more than 80,000 African Americans had participated. The event bolstered efforts toward political mobilization among African Americans across the state, which would prove critical to the ultimate passage of the 1965 Voters Rights Act. 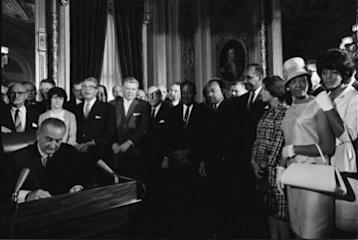 The Voting Rights Act, passed into law on August 6, 1965, was viewed by many as the culmination of the legal fight for civil rights in the United States. Under Jim Crow, from the late 19th and into the first half of the 20th century, Southern states enacted legislation that imposed significant, discriminatory constraints on the enfranchisement of African Americans. Such restriction included literacy tests, poll taxes, property ownership requirements, “good character” assessments, and clauses prohibiting from voting those whose grandfathers had been ineligible to vote prior to the Civil War. The 1965 law effectively silenced these Jim Crow laws. In essence, it gave teeth to the 15th Amendment, ratified nearly a century earlier, which forbid the federal government from denying a citizen the right to vote on the basis of race. The act applied a nationwide prohibition against the denial or abridgment of the right to vote based on former Jim Crow laws. And it also prohibited state and local governments with a history of discriminatory voting from implementing changes without first going through a “preclearance” federal oversight process. In essence, it decreed that states and municipalities with a track record of racial injustice would be required to get permission from the federal government before changing their voting policies and guidelines. This could be an expensive and labor-intensive process, but it was one of the key mechanisms for enforcing the law. Though racial inequity continued to pervade American life – in issues of housing, education, employment, etc… – the 1965 act signaled a dramatic shift in both the government’s tolerance for legal racial discrimination and the strategies and tactics of many national civil rights reformers. While few dispute the import of the legislation, over the course of its life, there have been challenges to its scope. In the four decades after its passage, Congress amended the Act on four occasions, each time considering and amending this preclearance requirement. In 2006, they extended the law for another 25 years. During congressional debates that year, some argued the preclearance requirement constituted an overreach of federal power and an undue burden on Southern states that, they claimed, have long since abandoned their discriminatory patterns. These conversations – in Congress and around the nation more broadly – culminated in 2012 when the Supreme Court agreed to hear Shelby County v. Holder. In the case, Shelby County, Alabama sued the US Attorney General, seeking for these preclearance requirements to be declared unconstitutional. The petitioner argued that the preclearance procedure was excessively expensive for small Southern counties and also that it was an overreach of federal oversight on state and local governments. In a 5-4 ruling, one of the final decisions announced in the 2013 season, the Court held that this preclearance clause is, indeed, unconstitutional. When Justice Roberts issued his opinion, some praised the Court for adapting the law to the current racial climate in the country. Others critiqued the bench for taking a step backward in the fight for civil rights progress. But both the majority and dissenting opinions – as well as many commentators – invoked the memory of the civil rights history of the 1960s to claim authority in this contemporary discussion of voting rights. Roberts, joined by Scalia, Thomas, Alito, and most notably Kennedy, held that the racial culture of the South has changed dramatically since the law was enacted nearly 50 years ago. The formula that Congress uses to determine the scope of preclearance, the opinion stated, is no long applicable, and the law itself is not in keeping with the times. The majority opinion and the dissent were divided upon ideological lines, with each side drawing distinct lessons from the history of the civil rights movement for support. The Roberts majority spoke of Philadelphia, Mississippi, where three civil rights workers were murdered during the 1964 Freedom Summer, and Selma, Alabama, site of 1965’s Bloody Sunday. “Today,” he wrote, “both of these towns are governed by African American mayors. Problems remain in these states and others, but there is no denying that, due to the Voting Rights Act, our nation has made great strides.” We as a nation have come a long way, the opinion implied, and we no longer need federal enforcement over voting procedure. In contrast, Ginsburg’s dissent called on the legacy of Martin Luther King and the need for a longstanding commitment to civil rights progress. “The great man who led the march from Selma to Montgomery and there called for the passage of the Voting Rights Act foresaw progress, even in Alabama,” she said. “‘The arc of the moral universe is long,’ he said, but ‘it bends toward justice,’ if there is a steadfast commitment to see the task through to completion.” Racial progress has been successful, wrote Ginsburg, because of the unflinching dedication of civil rights leaders, and because of federal oversight and intervention to remedy discriminatory practices. At the core of the disagreement, then, was the legacy of the fight for racial justice and the role that the federal government should play in supporting or administering that fight. The decision has already immediate practical consequences. Texas announced shortly after the Roberts opinion was released that a previously blocked voter identification law would go into effect immediately, and that redistricting maps there would no longer need federal approval. Pennsylvania, as well, will rely on the decision to justify the implementation of their ID requirements. But the decision also has significance as a bellwether for contemporary discussions of racial justice, and for the ways in which the legacy of the past may shape current and future policy. Abigail Perkiss is an assistant professor of history at Kean University in Union, New Jersey, and a fellow at the Kean University Center for History, Politics and Policy. She can be found on twitter at @Abiperk.